Nine Toes Later US 7" 1st press Black vinyl Stiff Rec. Nine Toes Later US 7" 2nd press Black vinyl Post Mortem Rec. Riot in Tompkins Square UK 7" 1st press Black vinyl Overground Rec. The Undead/Times Square US 7" 1st press Black vinyl Transparent Rec. 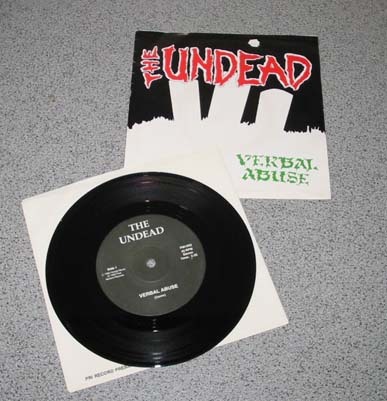 The Undead/Times Square US 7" 1st press Clear vinyl Transparent Rec. 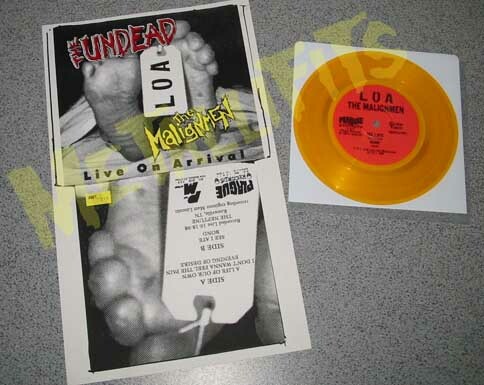 The Undead/The Malignmen US 7" 1st press Gold vinyl Post Mortem Rec. uncut cover pic. Third World USA GE 7" mispressed Red vinyl small centerh. 1/1 pic No Balls Rec. Third World USA GE 7" mispressed Red vinyl marbled 1/2 pic No Balls Rec. Third World USA GE 7" mispressed Red vinyl centerh.o.o.mid. 2/4 pic No Balls Rec. Third World USA GE 7" overpress. Red vinyl special.inserts 1/18 pic No Balls Rec. Third World USA GE 7" 1st press Red vinyl Lim.# ed 2/50 pic No Balls Rec. Third World USA GE 7" 1st press Red vinyl Lim.# ed 51/500 No Balls Rec. Be My Ghoul GE 7" mispressed White vinyl /black/marbled 1/10 No Balls Rec. Be My Ghoul GE 7" mispressed White vinyl /label error 2/10 No Balls Rec. Be My Ghoul GE 7" 1st press White vinyl Rabid Badger ed. 6/50 No Balls Rec. Be My Ghoul GE 7" 1st press White vinyl Regular ltd. ed. 1/550 No Balls Rec. Be My Ghoul GE 7" 1st press White vinyl Misprin.Cov./10 550/550 No Balls Rec. Halloween GE 7" testpress Black vinyl 2/2 No Balls Rec. Halloween GE 7" orange vinyl w/black streaks 2/14 No Balls Rec. Halloween GE 7" orange vinyl /silkscreened b-side 2/300 No Balls Rec. I Made A Monster US 7" 1st press Glow i.t.d vinyl Post Mortem Rec. I Made A Monster US 7" 1st press White vinyl Post Mortem Rec. I Made A Monster US 7" 1st press Red vinyl Post Mortem Rec. I Made A Monster US 7" 1st press Yellow vinyl Post Mortem Rec. I Made A Monster US 7" 1st press Blue vinyl Post Mortem Rec. I Made A Monster US 7" 1st press Green mar. vinyl Post Mortem Rec. I Made A Monster US 7" 1st press Black vinyl Post Mortem Rec. I Want You Dead US 7" 1st press White vinyl Post Mortem Rec. I Want You Dead US 7" 1st press Blue vinyl Post Mortem Rec. 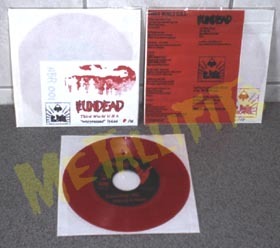 I Want You Dead US 7" 1st press Red vinyl Post Mortem Rec. I Want You Dead US 7" 1st press Yellow vinyl Post Mortem Rec. I Want You Dead US 7" 1st press Clear sp. vinyl Post Mortem Rec. I Want You Dead US 7" 1st press Black vinyl Post Mortem Rec. w/The American Plaque GE 7" testpress vinyl /silkscreened cover 3/5 No Balls Rec. w/The American Plaque GE 7" black vinyl /silkscreened cover 3/100 No Balls Rec. Never Say Die GE 12" 1st press Black vinyl (signed) Rebel Rec. Never Say Die US 12" 1st press Black vinyl (insert) Post Mortem Rec. Act Your Rage US 12" 1st press Blue marb. vinyl (signed) Post Mortem Rec. Act Your Rage US 12" 1st press Pink marb. vinyl (signed) Post Mortem Rec. Act Your Rage US 12" 1st press clear Redb vinyl (signed) Post Mortem Rec. Act Your Rage US 12" 1st press clear Gold vinyl (signed) Post Mortem Rec. Act Your Rage US 12" 1st press clear Blue vinyl (signed) Post Mortem Rec. Evening of Desire UK 12" 1st press Black vinyl (signed) Overground Rec. Evening of Desire UK 12" Testpress Black Vinyl (signed) Overground Rec. Live Slayer US 12" 1st press purple vinyl (signed) Skyclad/Skreamin'Skull Rec. Live Slayer US 12" 1st press purple vinyl (sealed) Skyclad/Skreamin'Skull Rec. Dawn of the Undead US 12" 1st press Black vinyl (signed) Shagpile/Post Mortem Rec. Til Death US 12" 1st press Gold vinyl (signed) Underworld Rec. Til Death US 12" 1st press Blue vinyl (signed) Underworld Rec. Still"The Undead"after... US 12" 1st press picture vinyl Post Mortem Rec./No Balls Rec. Live Slayer US CD 1st press Skreamin'Skull Rec. Dawn of the Undead US CD 1st press Shagpile Rec. Still"The Undead"after... SP CD 1st press BlackBird Rec. Sloppy Seconds - Where Eagles dare US 1st press 7" pink vinyl Roadkill Rec. Sloppy Seconds - Where Eagles dare GE 1st press 7" red vinyl Musical Tragedies Rec. Sloppy Seconds - Where Eagles dare GE 1st press 7" black vinyl Musical Tragedies Rec. Sloppy Seconds - Where Eagles dare GE 1st press CD cardsleeve Musical Tragedies Rec. Migranes - The Night has Eyes US sec press 7" white vinyl Sick Duck Rec. Times Square US 1st press CD Peepshow Rec. Live N.Y.C CZ 7" 1st press Black vinyl boot ! !